Everyone deserves a brand new medium format film camera once in their life. You can still buy these as new “old” stock on Ebay. If you have the means, spoil youself. Getting one of these babies, in a brand new, unopened carton is a special experience. They ain’t making many medium format film cameras any more, so don’t miss the opportunity. The Mamiya 7 is a brilliant camera. I know I say that about all the cameras on this site, but every camera has it’s own personality and user experience. It is a medium format film camera that shoots in a landscape 6×7 format. The negs and trannies are massive! You only get 10 shots per 120 roll. If you can get 220 rolls, 20 shots are yours before having to reload. Only getting 10 frames per roll really increases the importance of the shot choices you make. Pop away like you can on 35mm or digital, and you will end up in the poor house, or spend half your time reloading the camera instead of looking for the next shot. 65mm F4 / 32mm 35mm equiv. 135mm Panorama Kit – you can shoot panoramic format using 35mm film. I have used both the 80mm and 150mm lenses. A couple of mates have the 43mm lens, and swear by it. I find the whole idea of having to firstly compose the image through the external viewfinder, then focus through the camera viewfinder, then go back to check the composition through the external viewfinder again just too much hassle. Just typing out the process was enough to give me the shits. If you have the patience, and love wide angles, the 43mm is a great buy. Whilst not for me, some of the images captured using the 43mm are just outstanding. Check them out on flickr to see. The 80mm is the most versatile, and best suited to street photography. The 150mm is great for getting in closer on subjects. The camera has nice and bright framelines for the 65mm, 80mm, and 150mm lenses. The focus spot is bright and is quite large, which helps quick focusing. The rangefinder coupling system is smooth and precise. It is suprisingly easy to turn the focus ring on the lenses, but they are not “loose” or inaccurate. The tension required to turn the focus ring is perfect on the 80mm lens. This is important – if the resistance is too high ie. hard to turn, you need more force which can lead to you moving the ring too far once it starts moving. Too low, and again, you can go past the point. The 150mm lens is a little stiff, but I bought that lens second hand, so I can’t complain. The lenses use an electronic leaf shutter system which is very quiet. Very, very quiet! The viewfinder displays shutter speed and over/under exposure. The symbols sometimes choose not to show themselves in bright sunlight, particularly when you are not looking through the viewfinder at precisely the right angle defined by the optical engineers at Mamiya. Overexposure is a real issue for the Mamiya – I have often missed the subtle warning in the viewfinder and ended up with a ghostie shot – stacks of white and some vague outlines. You get used to it after a while, and find yourself double checking for the exposure warning. The lenses are all a bit on the slow side – the best being F4. But are very sharp and great quality. I am not an expert on optics, but every article I have read on the internet says so, and I have no evidence to the contrary! The camera is not really much bigger than a standard SLR, and is actually lighter than most. The wonderful reason behind this is that most of the body is shonky plastic. The body, film door, dials, and levers are all plastic. I have nightmares about various bits and pieces breaking off. I recently had a fall and cracked the top cover. You can read about it here. Luckily, Mamiya are still stocking spares! The body all fits together perfectly, but the plastic has it’s issues. The command dial that controls film and shutter speed has the numbers printed on. Some of them are already starting to wear off. This is a camera that needs to be handled carefully. It is an interesting trade off – the camera is super light. One of the lightest in my collection. You can sling it over your shoulder for the whole day without developing one ache or pain. The lenses are all metal, and great quality. Seriously, pick this thing up and it feels light as a feather. There is no separate back – so once you load up a film, it is there for the whole roll. Make wise choices! Mamiya even recommend on their website that you might need two bodies. Hmmm, of course you do. To change lenses, you have to engage a curtain that winds across to separate the film from daylight. Again, the winder is a cheap piece of plastic, which is almost guaranteed to break someday. I am often tempted to purchase a second body just in case – if I had Bill Gates kind of money, that is. The shutter is the quietest I have experienced with the exception of the Bessa III, which is a rebadged Fuji GF670. There is only the tiniest “click” as you depress the shutter button. The shutter button is really well designed. 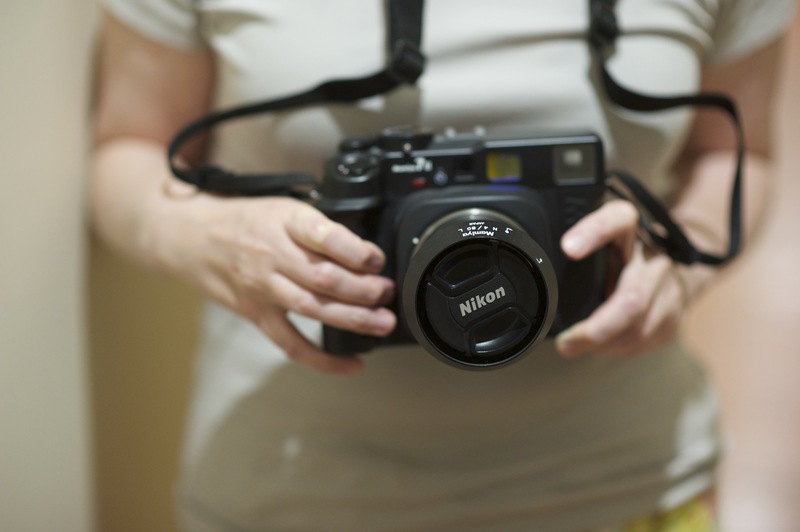 It is quite large, and has a minimal amount of travel to fire the shutter. Depressing the shutter button is one of many things that can affect the sharpness of the resulting image. The Mamiya’s is very sensitive, and only needs a very light pressure, which avoids any tilting of the camera. The half press is needed to get the light reading, and I have occasionally mistakenly fired the shutter. The light meter is generally accurate enough, but feels a bit more spot orientated than a matrix style. Exceptionally light and relatively small for a medium format camera. Easy to carry around for hours on end without any muscle strain. 6×7 format produces large negs for scanning. Still available “new” in the box. One of the better focus spots for a rangefinder. Plastic body and parts are a bit on the “delicate” side. Difficult to see exposure warnings in the viewfinder in bright light. Only 10 shots per roll of 120. Lack of extensive second hand options. Printed numbers on the command dial will eventually wear off. The Mamiya 7 II is light and produces great images. 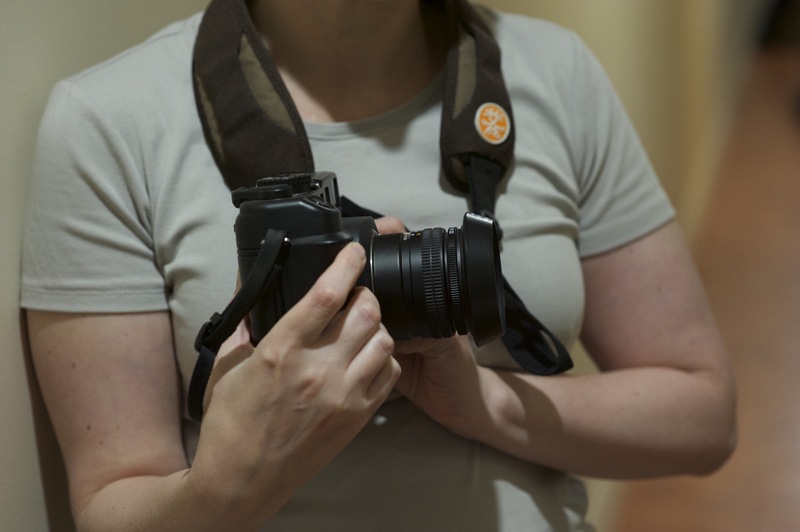 I love this camera as I can carry it around all day without any aches or strains. Travelling with the Mamiya 7 is a treat – it doesn’t weigh down your bags like most other medium format cameras. Just treat it gently. Thanks again to my wife for hand modelling!